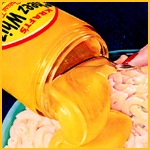 “Never, no never before have you ever had anything like Kraft’s Cheez Whiz!” begins the copy in New Cheez Whiz. And they weren’t kidding. You could spoon it, heat it and spread it. “You’ll see for yourself there’s no end to the quick cheese tricks your jar of Cheez Whiz holds.” This begs the question, who is the trick on? This is the original pamphlet that launched the radioactively golden cheesy comestible. It’s from the year 1953, perhaps the most amazing year in the history of convenience foods. That incredible year saw the introduction not only of Cheez Whiz, but also Eggo Waffles, the Starkist Tuna brand and the landmark couchside culinary achievement of the first Swanson TV dinner. So imagine what it was like in the dark winter of our discontent when cheese didn’t flow and then bask in the glorious golden summer of New Cheez Whiz.